Work like you don't need the money, Dance like no one is watching, Love like you've never been hurt. With having diabetes and being on antibiotics frequently, I tend t get yeast infections on a regular basis. I also have stomach aches freqently due to different medications. 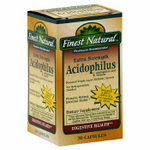 After taking Acidophilus for about 2 weeks I have noticed that my stomach aches have decreased as well as not getting yeast infections as often.